While this is equipped, the wearer cannot be damaged by barbarians, hail of arrows, or non-elemental attacks. When receiving any fire damage however, the damage is increased by one. When receiving fire aligned damage, it can come from a variety of sources: Fire Attacks, Blazes, or through Chains. Even if it was received through another players character ability, the source is irrelevant. When any fire damage is received, the damage is increased. Elemental attacks can still be escaped. Non-elemental attacks neither need to nor can be responded to by playing an Escape. If hit with a Lightning Attack, the wearer receives only the standard damage. Abilities that take place upon the delivery of an attack still take place. The Gender Swords can still be used against the Wood Armor with a normal Attack. After the Gender Swords ability, the attack is discarded since the target is then unaffected. Zhuge Liang makes a good combination with the Wood Armor. This is especially true when using "Empty City". Having no cards makes him immune to both Fire Attacks and Blazes. The Wood Armor also protects him from Barbarians and Hail of Arrows. This keeps him safe from almost all the flack that flies around the battlefield. The Wood Armor is very useful for the people who like to sit back and not get involved in the fight. This armor is great for that since it shields you from both Barbarians and Hail of Arrows, both possible sources for collateral damage. Beware of fire however. You will be the first target they think of when someone can use it. Even if someone is not after you directly, most won't think twice of using Chains and you as the sacrifice. Also watch out for the Fire Fan. Make sure it doesn't stay in play. After that, keep up the defensive for the odd Fire Attack or Blaze and watch everyone else get worn down. Also known as rattan armor, this is what Zhuge Liang had to face as he was fighting Meng Huo and the other Nanman leaders in the south. 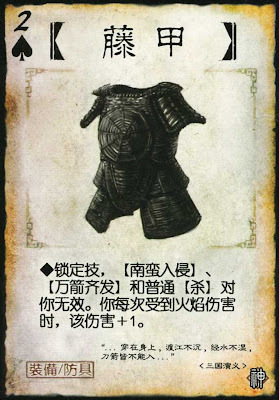 Wu Tu Gu is most remembered for leading an army fully equipped with this armor. His soldiers were impervious to swords, arrows, and spears. The men of Shu simply could not cut them down. The armor was also completely water resistant. the soldiers took off their armor and used them as rafts to float across the rivers. This strength comes at a cost however. The armor is very vulnerable to fire. In the wet southern climate, this is not much of a problem, but they are fighting someone as resourceful as Zhuge Liang. He lured the Nanman soldiers into a valley and sprung the trap on them. Every last soldier was engulfed in flame. This was the final piece in pacifying the south, but Zhuge Liang regretted that it came to this. The reason this armor is so strong is that it takes two years to make a set. Vines are soaked in oil and dried repeatedly for long amounts of time. Recently in Beijing, they compared this armor with cotton armor and chain mail. Surprisingly, the rattan armor actually outperformed both of its competitors.